Lymphedema is a painless, progressive accumulation of protein-rich fluid in the interstitial spaces of the skin, resulting from an anatomic or functional obstruction of the lymphatic system., It is most common in the lower limbs, about 80% of cases, but can also occur in the arms, trunk, and external genitalia. The primary pathology leading to lymphedema is dysfunction of the lymphatic transportation system. Disruption of the lymphatic systems by pathological processes such as trauma, surgery and radiotherapy, infection, and congenital abnormalities can lead to lymphedema. Primary lymphedema is usually as a result of congenital abnormalities in the lymphatic system which can be either aplasia or hypoplasia., Lymphedema praecox is early-onset lymphedema, typically before 35 years. It is characterized by hypoplastic lymphatic system and is usually unilateral. Lymphedema tarda usually presents after 35 years of age, and there is much debate regarding its etiology. Milroy disease is the autosomal dominant form of typically bilateral primary lymphedema with the very early age of onset and is due to agenesis of the lymphatic system. Secondary lymphedema results from obstruction or interruption of the normal lymphatic channels. This can be iatrogenic (surgery and/or radiotherapy) or due to trauma or infections such as filariasis. Lymphoscintigraphy is the primary imaging modality used in determining a diagnosis in patients with suspected extremity lymphedema.,, The current protocol in our institution utilizes 20–40 mega-Becquerels (MBq) of 99-metastable technetium (Tc-99m) nanocolloid, injected intradermally, with static image acquisition at 5-min, 15-min, and 1.5-h intervals. Field of view is at the injection site on 5-min images and from the feet to the pelvis for the 15 minutes and 1.5 hour images. The patients walk for at least 5 min before the 15-min image. Quantitative and semiquantitative analysis parameters can be used to complement visual analysis, to better characterize discrete changes, or to monitor therapeutic assessment in sequential studies. Quantitative analysis provides a means to unify the interpretation of scintigraphic findings, allowing for the detection of small changes in lymphatic function. Furthermore, the quantitative analysis can facilitate the comparison between studies during follow-up or after therapeutic interventions in a patient. Analysis by less experienced radiologists and nuclear physicians can be enhanced by quantitative analysis. The data obtained would provide a more sensitive and reproducible approach to differentiate normal patients from those with mild lymphedema, more so for the less experienced radiologist. This was a prospective cross-sectional study, in which consecutive patients undergoing lymphoscintigraphy at the Nuclear Medicine Department for suspected lymphedema, on the basis of unexplained lower-limb swelling, were recruited. Patients without images at 1.5 h were excluded from the study. The study had a power of 80% and with 0.05 margin of error. The estimated sample size was 102, 51 for the group with lymphedema and 51 for the group with normal limbs. Patients were positioned supine and the Tc-99m nanocolloid was injected intradermally to the first interdigital web of both limbs – if the dose was uneven, the larger dose was administered to the affected or more edematous limb. A static planar image of the feet with the entire injection site in the field of view was obtained 5-min postinjection, on a 256 × 256 matrix. The patients were then asked to walk up and down the hallway 4–5 times (at least 2 min) and return back for 15-min delay images. A hemi-body planar image (starting from hip to feet) was obtained at 15-min and 1.5-h postinjection, using a 256 × 1024 matrix. Normal or abnormal limbs were selected on the basis of qualitative analysis by a consultant nuclear medicine physician with a 15-year experience. Normal limbs showed prompt and uniform migration of the radionuclide through discrete lymph vessels. Abnormal limbs had a combination of any of the following findings: interruption of lymphatic flow, collateral lymph vessels, progressive dermal backflow, delayed flow, delayed visualization or nonvisualization of lymph nodes, reduced number of lymph nodes, dilated lymphatics, and in severe cases no visualization of the lymphatic system at all [Figure 1]. A similar analysis was done for the abnormal limbs. Approval for the study was obtained from the institutional ethics review committee. All the study participants gave written informed consent. Consent was obtained from all the adult study participants and from the guardians of participants aged below 18 years. This study portends no harm to the participants, and the standard imaging protocol was not altered. The study investigators have no conflict of interest to declare. All statistical analysis was performed using SPSS version 17 (SPSS Statistics for Windows, SPSS Inc: Chicago, USA). Fifty-five bilateral lymphoscintigraphic examinations were performed between August 2014 and January 2015. Fifty-two patients (25 males and 26 females) were included in the final study. Excluded patients included one where 1.5-h images were not acquired and two patients in whom both injection sites and ilioinguinal nodes were not in the field of view on the 1.5-h images. The median age was 37.5 years, with a standard deviation (SD) of 19.7; their mean duration of lymphedema was at least 5.5 years [Table 1]. The proportion of males with positive scans (diagnosis of lymphedema) was significantly higher (78% vs. 36% P < 0.001). Both limbs were equally affected with lymphedema, with no preference for either side [Figure 3] and [Table 2]. The mean for each of the groups is illustrated in [Table 3] and [Figure 4]. The data were skewed to the right in both the normal group and the group with lymphedema [Figure 5]. The Kolmogorov–Smirnov test for normality, however, showed a lognormal distribution which is a common finding in many biologic samples [Figure 6]. Following analysis of variance (ANOVA), the difference of the means between the two groups was statistically significant (P ≤ 0.0001). An F value (a measure of intergroup vs. intragroup variance) of 81.37 indicates a large difference. Using different cutoffs of percentage ilioinguinal uptake, specificity and sensitivity were calculated, and the values obtained were used to plot a receiver operator characteristic (ROC) curve [Figure 7]. Area under the curve (AUC) was also estimated. AUC was 0.924. The cutoff value giving the best trade-off between sensitivity and specificity (highest and most to the left) is 9.74 (sensitivity = 86.8%, specificity = 82.4%). The study sample consisted of 36 females and 16 males. The mean age of the population was 37.9 years, with a range from 3 to 90 years. It was noted that most patients presented in their 30s to 40s, which perhaps represents patients with lymphedema tarda. Secondary lower-limb lymphedema is not common in our setting. This is in sharp contrast to studies in Europe and Asia where secondary causes predominate. The average onset of lymphedema was 32 years. This could be partly explained by lymphedema tarda which prior authors have given as onset of lymphedema after 35 years. The patients whose onset of edema was between puberty and 30 years represent patients with lymphedema praecox. A small number of patients with congenital lymphedema presented before puberty. The average duration of edema at the time of presentation was 5.4 years (0–30 years). The fact that most patients sought intervention after a mean duration of 5 years may reflect onset of other clinical symptoms besides edema or worsening edema. Following qualitative lymphoscintigraphy, only one male patient had a normal examination while the rest had either unilateral (5 subjects) or bilateral lymphedema (10 subjects). In contrast, 16 females had normal limbs, while 14 had unilateral lymphedema and six had bilateral lymphedema. 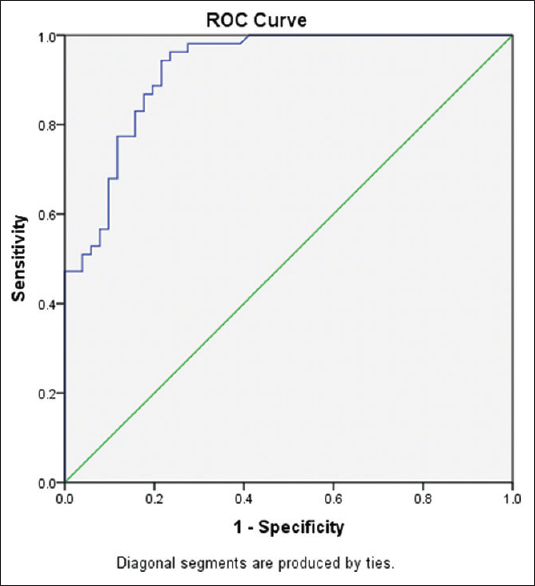 The proportion of males with positive scans was significantly higher (78% vs. 36% P = 0.000). This suggests that edema of whatever etiology may be more common in females, while edema in males is more likely to be lymphedema. Most other studies have indicated a higher incidence of lymphedema among females. Indeed, some causes of lower-limb swelling such as lipedema are exclusive to women. Obesity which is a recognized risk factor for lymphedema  is more common in females. In a study by Dalia et al., a total of 77 patients (66 women, 11 men) were studied. Of these, 21 patients had unilateral extremity involvement and 56 had bilateral lymphedema. It seems that unilateral lymphedema is more common in our population. Using qualitative lymphoscintigraphy as the reference standard, sensitivity and specificity for each ilioinguinal uptake value were computed and an ROC curve was plotted. The AUC was 0.924 (P < 0.001). This indicates that quantitative analysis is an accurate tool in the diagnosis of lymphedema. By selecting an ilioinguinal node uptake of 9.7%, lymphedema could be diagnosed with 86.8% sensitivity and 82.4% specificity. When lymphatic dysfunction is bilateral, quantification of lymph node accumulation and clearance of activity from the injection site both become important parameters. Again, it should be emphasized that these parameters are strongly influenced by the amount of exercise a patient can perform. In addition, the uptake index can be used to monitor progression of disease as well as response to therapeutic measures. Ilioinguinal lymph node uptake can be used for the differentiation of normal limbs from limbs with lymphedema. Quantitative analysis if developed and standardized can be an accurate tool in the diagnosis of lymphedema. Quantitative indices would be useful for monitoring of disease progression and efficacy of therapeutic measures. Moshiri M, Katz DS, Boris M, Yung E. Using lymphoscintigraphy to evaluate suspected lymphedema of the extremities. AJR Am J Roentgenol 2002;178:405-12. Keeley V. The use of lymphoscintigraphy in the management of chronic oedema. J Lymphoedema 2006;1:42-57. Weissleder H, Weissleder R. Lymphedema: Evaluation of qualitative and quantitative lymphoscintigraphy in 238 patients. Radiology 1988;167:729-35. Scarsbrook AF, Ganeshan A, Bradley KM. Pearls and pitfalls of radionuclide imaging of the lymphatic system. Part 2: Evaluation of extremity lymphoedema. Br J Radiol 2007;80:219-26. Szuba A, Rockson SG. Lymphedema: Classification, diagnosis and therapy. Vasc Med 1998;3:145-56. Ter SE, Alavi A, Kim CK, Merli G. Lymphoscintigraphy. A reliable test for the diagnosis of lymphedema. Clin Nucl Med 1993;18:646-54. Andersson HC, Parry DM, Mulvihill JJ. Lymphangiosarcoma in late-onset hereditary lymphedema: Case report and nosological implications. Am J Med Genet 1995;56:72-5. Shenoy RK. Clinical and pathological aspects of filarial lymphedema and its management. Korean J Parasitol 2008;46:119-25. Warren AG, Brorson H, Borud LJ, Slavin SA. Lymphedema: A comprehensive review. Ann Plast Surg 2007;59:464-72. Sapienza MT, Endo IS, Ferraro GC, Tavares MG, Neto C, de Carvalho G, et al. Criteria for semi-quantitative analysis of lymphoscintigraphy in lower limb lymphedema. J Vasc Bras 2006;54:288-94. Yuan Z, Chen L, Luo Q, Zhu J, Lu H, Zhu R, et al. 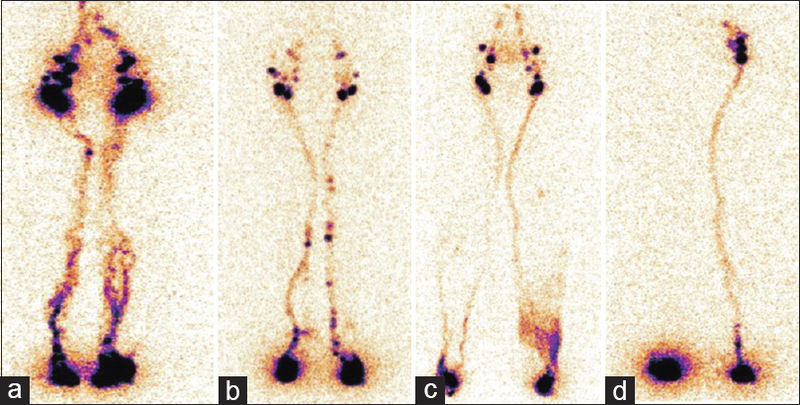 The role of radionuclide lymphoscintigraphy in extremity lymphedema. Ann Nucl Med 2006;20:341-4. Sadeghi R, Kazemzadeh G, Keshtgar M. Diagnostic application of lymphoscintigraphy in the management of lymphoedema. Hell J Nucl Med 2010;13:6-10. Herbst KL. Rare adipose disorders (RADs) masquerading as obesity. Acta Pharmacol Sin 2012;33:155-72. Mohler ER, Mehrara B, Eidt JF, Mills JL Sr, Burstein H, Collins KA. Clinical manifestations and diagnosis of lymphedema 2013. Available from: http://www.uptodate.com/contents/clinical-features and-diagnosis-of-peripheral-lymphedema. [Last accessed on 2016 Dec 12]. Dalia RM, Martins GR, Barbosa R, Lima CF, Siqueira CF. 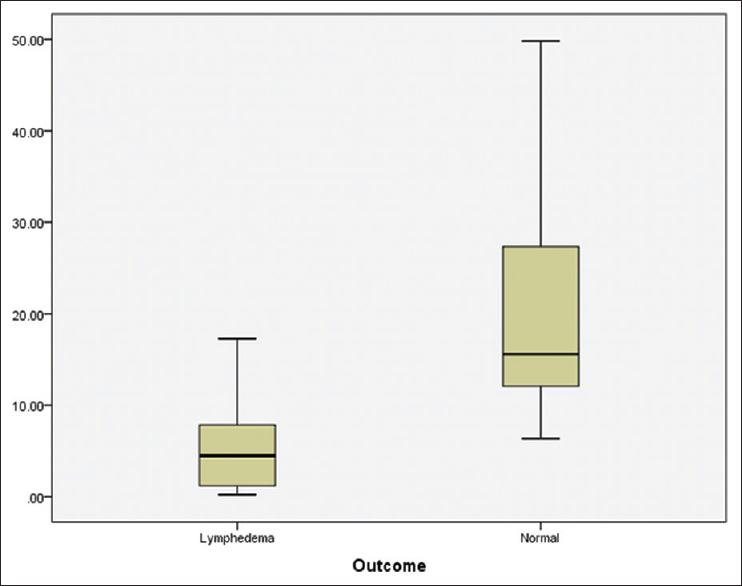 Qualitative and quantitative lymphoscintigraphy in the evaluation of lower limbs lymphedema. Braz Arc Biol Technol 2005;48:159-62. Szuba A, Shin WS, Strauss HW, Rockson S. The third circulation: Radionuclide lymphoscintigraphy in the evaluation of lymphedema. J Nucl Med 2003;44:43-57. Kramer EL. Lymphoscintigraphy: Defining a clinical role. Lymphat Res Biol 2004;2:32-7.